Apple's tangled relationship with Google is also a profitable one for the iPhone maker, as one analyst estimates Apple pulls in $1 billion in pure profit from a search agreement between the two companies. In a recent report from Morgan Stanley titled "The Next Google is Google," analyst Scott Devitt estimates that Google pays Apple roughly $1 billion per year in order to position its search engine as the default option on iOS devices. Such an agreement would remain beneficial to both Apple and Google, despite the growing complications brewing between the two firms. The sum of $1 billion per year is almost a rounding error for Apple, which pulled in $13 billion in profit last quarter, but it would represent a pure profit stream for the Cupertino company, one acquired with little effort on Apple's part. For Google, which pulled in $2.89 billion in profits for the last quarter, the billion dollar agreement amounts to a traffic acquisition cost: about $250 million per quarter in order to keep a massive mobile platform reliant on Google search by default. Google is also largely reliant upon iOS for mobile revenue, earning 80 percent of its ad revenue from 2008 to 2011 from iOS devices. 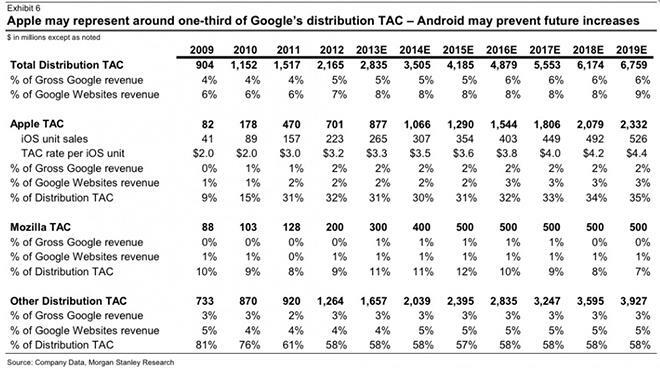 This isn't the first time a billion dollar estimate has emerged regarding iOS and Google. In March of last year, an analyst at Macquarie posited largely the same thing, with an additional estimate of roughly $300 million in profit for Google from the arrangement. In 2010, rumors emerged that Google was paying Apple more than $100 million in a revenue sharing deal in order to retain the default search spot on the iPHone. Google, the world's largest search engine, is already known to pay other companies in order to keep Google search the default option. In addition to Apple, Devitt estimates that Google will pay $300 million to Mozilla  makers of the Firefox web browser and Firefox mobile operating system  in order to keep Google as the default search on that group's products.